Thoughts of a Closet Recluse: How to deal with keyboard warriors, Karyn Bailey-style. How to deal with keyboard warriors, Karyn Bailey-style. Nothing will ever give you more satisfaction when you achieve, after being told, “you can’t”. People are entitled to opinion and perception, the latter; a subjective form that contorts a reality into an objective form to make us believe that that is true. So when you, as an individual, deform another individual’s already-deformed belief so that you, in this case, an athlete, had the willpower, the talent and the execution to achieve your goal, it’s the rush of endorphins that can’t make you do anything but smile. On Thursday night, that was Melbourne Vixens shooter Karyn Bailey. The 29-year-old had just tied with Vixens defender, English international and three-time recipient of the award, Geva Mentor, and claimed a joint Sharelle McMahon Medal as the Melbourne Vixens’ most valuable player. You often find in sports that role-players can be much-maligned members of the team. They are, after all, there to perform a specific job. Their assessment is harsh; it’s either a pass or fail – there is no middle ground. In the fledgling years, Karyn was a ‘role player’. A shooter that sat on the Melbourne Vixens bench behind names such as Caitlin Thwaites and the much-revered Sharelle McMahon. Both players are Australian representatives and bloody good ones at that; the latter has a medal attached to her name. Tall and with a no-holds-barred presence in the goal circle, Australian netball fans have always found at least one way to critique Karyn. Too slow. Doesn’t cover enough court. Can’t shoot. Can’t shoot under pressure. Doesn’t work with her teammates up the court. Not fit enough. Throw every negative at Karyn, she’s probably heard it. Her skin’s as thick as elephant hide, and she’s taken every hit of every keyboard warrior “advice” and kept moving forward. Thursday night’s award was for them. Complimented with a quiet, two-finger salute. Karyn’s career at Melbourne as shooter revolved around her getting court time when Sharelle McMahon wasn’t on the court. Anyone who knows anything about netball will know that trust and fluency in combinations is vital to the team, all over the court. This doesn’t rub off when it comes to the goaling combination. The aim of the game at the end of the day is to put the ball in the bottom of the net more times than your opposition. Simples. Finally, Sharelle retired in 2013. Karyn had just started making the goal shooter bib her own, then the Vixens announced that long-serving, Australian-representing shooter, Cath Cox, was coming to Melbourne. Round 1, 2014 began, and yet again Karyn sat on the bench. A quarter went by, the Vixens dominated and the second quarter began. The second term was a little bit more of a struggle and whether it was by design or a lack of patience, Vixens coach Simone McKinnis called Cath off the court, took the GS bibs off her and stuck them on Karyn. Of the remaining 58 quarters of the Vixens’ premiership season, Karyn would play in 50 of them. Karyn Bailey was keeping one of Australia’s best goal shooters on the pine. Where were the nay-sayers? Everywhere.The talk wasn’t so much pro-Cath either, it was just a running commentary of why Karyn wasn’t good enough. For an insider, it was totally unjustified. No one saw the behind-the-scenes work to keep her knee functioning with a posterior cruciate ligament hanging by a thread. No one saw the work done to keep Karyn on court when the ligaments in her ankle were screaming for a rest. There was no complaints, no fuss and by June 22, Karyn Bailey was an ANZ Championship premiership player and an Australian Diamonds camp invitee. 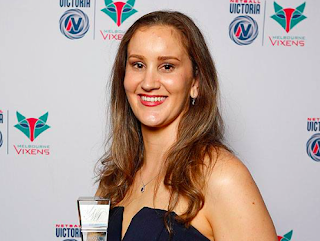 Yet still the commentary was there and it was there right through the off-season and into the pre-season when the Vixens acquired veteran NSW Swifts Carla Dziwoki and Karyn herself was missing from a Vixens family day function, looking after her ankle. Rightly or wrongly, the spotlight in the Vixens’ goaling circle belonged to Tegan Philip, who’d come off one of the years of her life. A surprise Diamonds squad member, who played a pivotal role in Australia’s Commonwealth Games gold medal in Glasgow last year. For the Vixens, a year that started promisingly, crashed hard. Yet, Karyn emerged from the ashes, with former critics in the media changing their tune to describe her as “one of the calmest shooters in the competition”. Another Diamonds camp invite; and now the talk from the people that mattered shifted as to whether Karyn could even knock off Thwaites and West Coast Fever’s Caitlin Bassett for the goal shooter position. What about the talk from the rest of the public? Still unchanged. Mid-season, Karyn notched up her 50th ANZ Championship. The Melbourne Vixens Twitter account asked its adoring fans: what is your favourite highlight of Karyn’s career to date? The response? “Nothing”. “There hasn’t been one”. “I don’t think she’s very good”. Karyn’s response? She shot 41 goals from 43 attempts in her milestone match and nearly doubled over in laughter when she read the responses. It takes us to Thursday night. As much as Karyn’s receiving of the 2015 Sharelle McMahon Medal was to her support network from friends, family, coaches and teammates, there was a lot of it that was her silent, action-orientated response to those who’ve tried to bring her down. Yes, she was overlooked for the Australian Diamonds side to play in this year’s Netball World Cup, and make no mistake, the ultimate dream of representing her country burns strong. But Thursday night’s recognition is a step forward to earning the respect she deserves. From a knockabout girl of the Northern Territory, to the darling of the Melbourne Vixens. What to next? Watch this space.